Why Personal Best Fitness Centre Bayswater? Personal Best Fitness Centre has been established for over 20 years by Ian Reynolds Ba App Sci(Human Movement). During that time Ian has been President of Victorian Fitness Industry Assoc, on the Vicfit Registration Board,Fitness Victoria and a founding member of the TAFE Committee developing the core structure of the current Fitness Industry qualifications. Ian and all his Bayswater gym staff are committed to Professional excellence and personalised service. From the moment you walk in you will feel the friendly environment and the welcoming staff from the front desk to the group exercise room. You will always be motivated, gently encouraged and cared for with a smile. Each of our staff have a passion to achieve your goal, YOUR Personal Best. 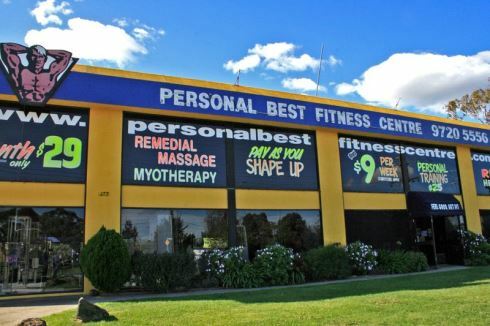 Personal Best Bayswater gym is about YOU, your goals and aspirations. OUR GOALS are to help you achieve your goals and to transform your life into something very special and very different through our dedicated Bayswater gym team. All our members are very special, therefore a limit on our memberships is essential. Heavy advertising is not in our plans, so enjoy this hidden retreat in Bayswater where we will take care of all your fitness needs. Welcome to Personal Best Bayswater gym. Bayswater personal trainers can guide you in your training and goals. Our Bayswater gym includes state of the art pin-loaded equipment. Join the social fun with our members in the members lounge. On-site Bayswater child minding to cater for busy parents. Classes including Bayswater Yoga, Pilates, Latin and more. Enjoy a relaxing massage as you embrace your personal best. Add cardio boxing into your fitness training. Within the free weights room, there is a designated area for kickbag and a speedball work. Incorporate boxing into your training. All Bayswater gym staff are caring and qualified to assist you with any queries at all times. The gold package includes one-on-one Personal Training on a weekly basis. It incorporates the initial Physical Evaluation followed by re-assessments each 30 workouts. Your personalised program will include three personal training sessions. A new program is designed as a follow up each 15 workouts. This membership is designed with one-on-one Personal Training for those wanting to achieve their goals with the maximum results in a minimum time. This package incorporates the initial Physical Evaluation followed by re-assessments each 30 workouts. Your personalised program will include three personal training sessions to familiarise and demonstrate correct techniques. As a follow, a new program is designed each 15 workouts and another personal training session is included. This program is designed with you long term goals in mind. This package includes an initial Physical Evaluation followed by one program and three personal training sessions. Includes full use of all facilities for those wanting to create their own exercise regime and workout in an open and inviting environment. All group exercise classes including Aerobics, Turbo/Circuit, Yoga, Power Bar, Cardio Kick-Boxing and many more. Specially designed memberships to suit the Corporate market from small to large corporation that include lunchtime programs with time effiency in mind. All the above Programs include group exercise classes, Yoga, Sauna, Spa and locker facilities without any extra cost. 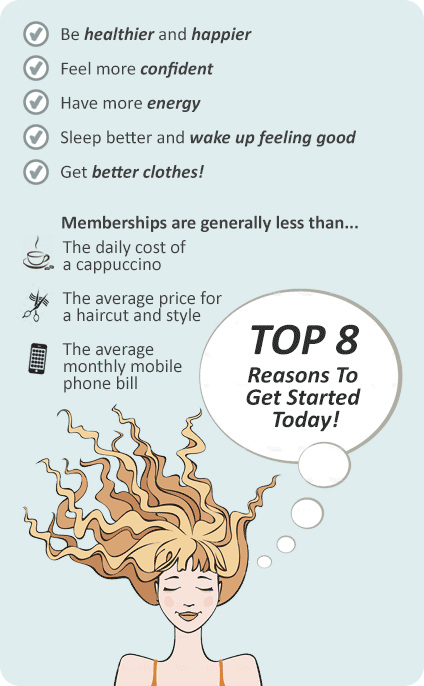 There are variations to these Memberships including Off-Peak, Pensioner and Student rates as well as tailor-made packages.